No, there is not a typo in the title of this blog post. Shocking, I know. But before you all go crazy in the comments section and start sending doctors to my home to treat me for a life-threatening fever or paranoid schizophrenic delusions, let me explain. I was super angry after the game on Saturday night and through most of Sunday, too, but now that I've had time to calm down and really think about it, I think there is definitely an up-side to BYU losing. Of course I wanted BYU to beat Utah on Saturday, and I expected they would. The Cougars were the better team going into the contest, no doubt. But I think if Riley Stephenson's final field goal had been 6 inches over and gone through the uprights, sending the game into overtime, the consequences could have been much worse. Would it have been sweet, sweet justice for those moronic fans who rushed the field TWICE before the game was over? Absolutely. But it also could quite likely have made me hate the "Holy War" rivalry even more than I already do. Utah escaped with a 24-21 win over BYU at home, even though it was the home fans, players and clock operator that nearly took the victory away. 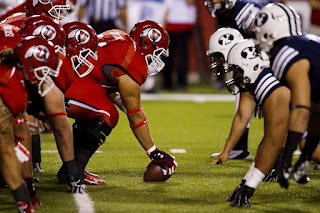 Had that happened, and BYU gone on to win, the rivalry could well have adopted a more sinister edge, with Utah fans looking forward to the two-year breakup between the teams in 2014 and 2015. BYU fans would have angrily defended the win, even as Utah tried to discredit it. Basically, if BYU had made that field goal and managed to win in OT, Utah fans probably would have been so angry, it wouldn't surprise me if they would have come storming down to Provo and burned LaVell Edwards Stadium to the ground. No joke. 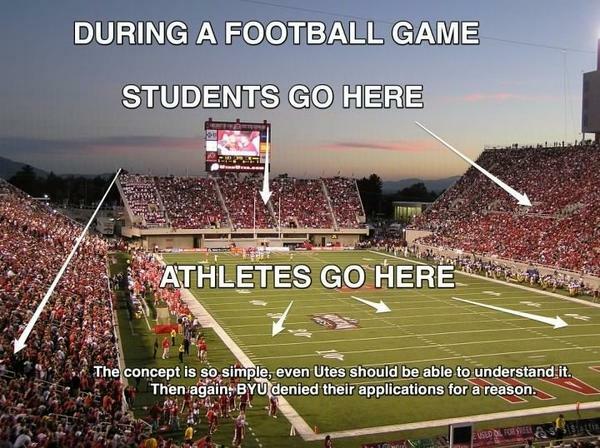 And the last thing I want is more angry Utah fans in the world. If they're happy, at least they're not going to go on any rampages. Yes, they'll brag about it and never let us Cougars forget it, but I think I'll sleep more soundly at night knowing that some Utah fan isn't going to egg my car because I have a BYU license plate frame and steering wheel cover. That's right-- I'm terrified of the University of Utah, especially their avid "fans" (and by "fans", I mean those who hate BYU more than they like the U of U). Go ahead and make fun of me if you wish. But they all scare the living daylights out of me. Because I am such a huge BYU fan, and everyone I know knows it, I automatically become an easy target when Ute fans get angry. I was not pleased when I spent my Sunday morning cleaning up the red streamers from my front porch left by some not-so-anonymous members of my ward who are Ute fans only because they like to see the reaction they get out of all the BYU fans in Utah Valley . . . but is Ute bragging better than the alternative (unsuppressed and unrelenting anger)? I submit that it is. Okay, I'll get off my soapbox now and talk about the game itself. What happened?!? Something was clearly wrong with Riley Nelson. On the post-game show, Bryan Logan said he was concerned Riley may have taken a hard hit early on in the first quarter and was showing some signs of a concussion (wandering in circles, not being able to focus, etc.) And it would totally be just like Riley to keep on playing through a concussion. I really hope someone checks him out before it gets serious, if that is the case. It would explain a lot, though. Riley just wasn't himself. He wasn't playing with passion, which is sooooo not like him. It was like he had given up way before the game was over. The real Riley (or anyone on offense, for that matter) didn't show up until there were less than 4 minutes left in the game. Too little, too late. So, why didn't they put Taysom Hill in (and keep him in)?!? He only played a few downs, but he seemed to have the fire a lot more than Riley Nelson did. I guess I shouldn't question the coaching decisions, but to me, that should have been a no-brainer. Overall, there were too many fumbles and too many penalties. I think BYU may have set a world record for false starts . . . geez! It can obviously be attributed to poor communication between Riley Nelson and Houston Reynolds' backup, Blair Tushaus. When Houston left the game early on with an ankle injury, it was all downhill from there. In short, the Cougars need to develop better back-up plans for when injuries happen. There should not have been that gigantic lack of chemistry between Riley and the snapper. It may have ultimately been what cost them the game-- i.e. midway through the 3rd quarter, when the ball got snapped early, Alisa didn't fall on it like he should have (grrr...), and Utah picked it up and scored a 47-yard TD. ARGH. Cody's catch in the very end on 4th and 12-- I love that guy! He never gives up. Win or lose, I'd rather be a Cougar! Overall, I'm really proud of BYU for coming back and making it close, when it easily could have turned into another 54-10 situation. It was still a super UGLY game, for both teams. As BYUTV analyst Blaine Fowler put it on the post-game show, "Nobody wanted to win that football game." It was like they kept giving each other HUGE opportunities to capitalize, but neither team ever did. Utah won in the end "by default." Ridiculous. If it wasn't clear before now, I really hate this rivalry, if for no other reason than that it seems impossible for both teams to bring their A-game to the table. It almost always turns out to be nothing but a huge mess, which is never fun to watch, no matter who's winning. Yes, Saturday night was heartbreaking, but now it's time to forget about it and move on with our lives. Let's pick ourselves up and wrangle some Broncos in Boise on Thursday! Go Cougars!